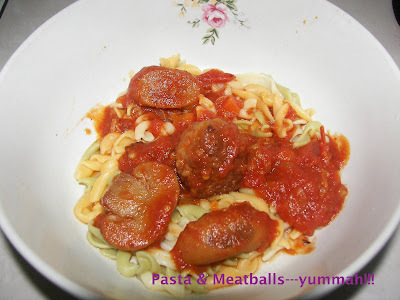 I have tried 2 meatballs recipe and both yield great results. Recently I wanted to make Jamie Oliver’s version of meatballs from the Ministry of Food podcast.The podcast can be downloaded via iTunes. The video of Jamie was peppered with a cheeky bit TWICE, when Jamie was saying about the different shape of balls and his eyes twinkled and we all know what it means!lol. Anyway,I wanted to try the recipe because the ingredients used are ingredients that I have never used while making meatballs like mustard and Jacob’s cream crackers(which works brilliantly as I found out!). The recipe is so easy and I tweaked it a bit by adding a clove of garlic,1 teaspoon extra of mustard,a pinch of salt and sugar. Below is the recipe because as Jamie said at the end of the video, ‘don’t forget to pass it on’! 6-9 Jacob’s cream crackers, bash it up into crumbs. Mix them all together,shaped into same size and fry until golden brown!Serve with spaghetti & tomato sauce/bolognaise.